Do you want to discover how you can successfully achieve all your goals without feeling stressed and overwhelmed? If you are new to productivity and goal setting or if you have tried and failed at it before, don’t worry. We all start at some point. I am Puja Mohan, and I have gone from aimlessly going through life as a young adult to working at a multinational company and publishing books and now being a full-time writer while taking care of my child and my house. Working in 90-day chunks changed my life. My first 90-day plan made big changes happen which were so overwhelming when I thought about them in the beginning. But not anymore. The secret lies in this, for anything to happen 5 years from now, you have to start today, set things in motion today. And that is what The 90-Day Plan Workbook is going to help you do. 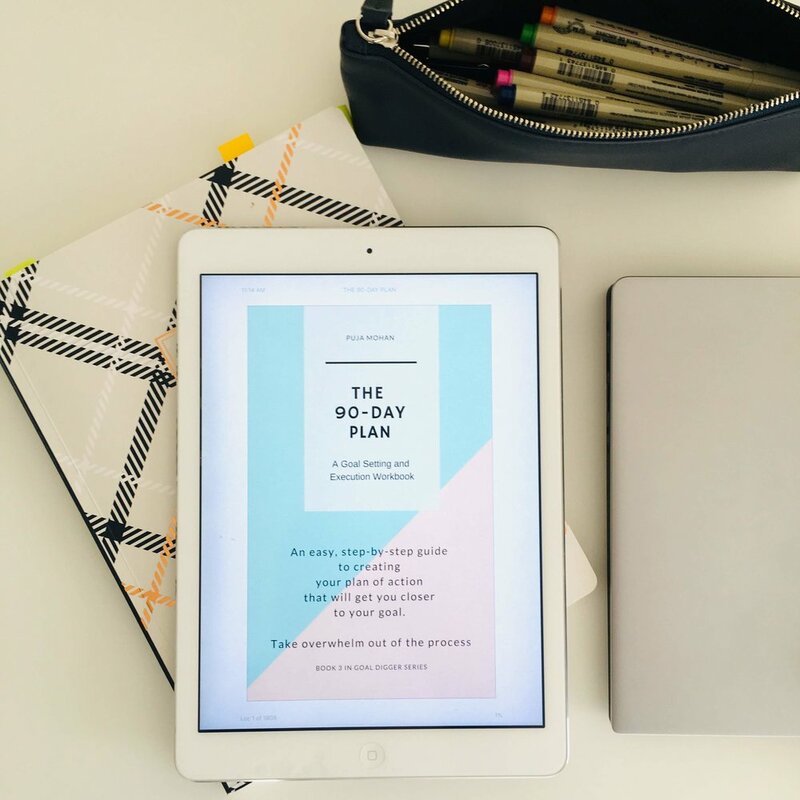 The 90-Day Plan Workbook is for you if you are tired of setting goals every year but don’t know what exactly needs to be done after that. It’s for anyone who wants to make a change in their life. If you need some handholding through the process of what happens after goals are set this workbook is for you. Whether you are a student, young adult starting your first job, parent managing home and children, seasoned professional, if you need some help with organizing your life, this workbook is for you. There are exercises that take you through each of your goals and helps you deep dive and create your set a step-by-step action plan that will get you closer to those goals. It’s designed to take overwhelm out of the process which is what keeps most of us from getting what we set out to achieve. This workbook will hold your hand through the process of finding exact actionable steps that you need to take to achieve your goal. It will help you form a detailed plan that works for you to achieve your goals. And it will also give you tools to help you keep the momentum and stay on track and see them through. Make 2019 your best year ever.